Some photos have emerged of Arsenal midfielder Lucas Torreira nursing something of a mystery injury in Uruguay’s latest game. The summer signing from Sampdoria arrived at the Emirates Stadium this season as an exciting prospect, but is yet to become a regular for Unai Emery’s side. 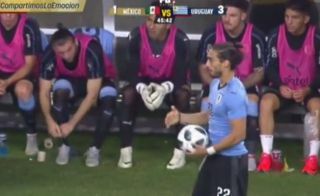 Torreira is reported by AFC Press Watch to have only played 45 minutes for Uruguay against Mexico, and can be seen in the picture below sitting on the bench with an ice pack over his left leg. The Metro have also carried the story, suggesting the 22-year-old’s knock leaves Arsenal sweating over his fitness, though it’s not really clear what the injury is or how long it could trouble him for.